Writing a fantasy story or role-playing scenario? Need to come up with names for towns, rivers, mountain ranges and so on, but tired of thinking up new names all the time? Here’s a handy technique I use. It takes a little work up front, but then it makes coming up with new names really easy. The thing about place names is: when you dig down deep into their meaning, they’re usually really obvious and descriptive. It’s only time and language change that obscures their meaning. Look at a map of Europe and you’ll find Copenhagen (“merchant harbor”) and Dublin (“black pool”). In Asia there’s Shanghai (“above the sea”) and Samarkand (“stone fortress”). The same applies to the native names anywhere else in the world. In places that have experienced substantial colonization, the conquerors often imported old names that didn’t relate to the landscape (New York, Wellington), but in other cases the new names given by colonizers were just as descriptive (Cape Town, Salt Lake City). The reasons for this naming pattern are fairly straightforward. If you live in a landscape where there are several rivers, but only one of them is muddy, or plenty of mountains, but there’s a big one with no trees on top, when you need to refer to that river or that mountain, you’re likely to say: “the black river” or “the bald mountain.” From there it’s only a short step to calling them “Black River” and “Bald Mountain”. As time goes on and language changes, place names tend to become fossilized and preserve older variants and meanings that the rest of the language has left behind. So, put these facts to work for you. 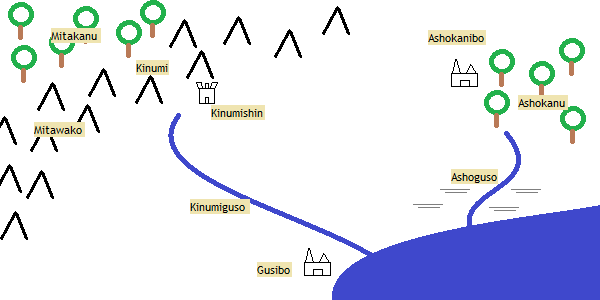 When you’re setting up your map, generate a list of place name elements and then you can quickly combine them to make new names for whatever you need. This is the basic version. It’s all you really need, but you can get more creative with it if you want and I’ll have some suggestions later. For now, these are the essentials. Start with your map. Here’s a simple one with a few geographical features and settlements. Pick out anything that needs a name and give it an obvious descriptive name. All we need to do now is generate words for each of these in the language of our fictional land. You can use real world languages for inspiration, or just make things up. The important thing is to try to give the language some consistent sound. For example, if we want this land to feel Scandinavian, we can make up some elements inspired by the sound of Scandinavian words and names. And it’s very easy to expand. Need a name for a fortress in the woods? Osvard. A river that runs through the mountains? Halmsto. A town in a snowy pass? Hederingruk. If we decide to go with, say, a Japanese flavor, all we need to do is come up with a new set of elements and plug them in. Notice that in this version, I’ve also made some adjustments to make the names flow better. Strictly speaking, “snowy mountains” should be “Mitaawako”, but I’ve elided the double-a into “Mitawako” because I think it sounds better. This happens to real world names all the time, so go right ahead. If you’re using real world languages for inspiration, it’s up to you how faithful you want to be. A Japanese speaker would probably not think much of my list (and for all I know, some of these combinations mean something hilarious, offensive, hilariously offensive, or offensively hilarious in Japanese). All I was going for here was a sound, but you can do your research and craft authentic name elements if that’s what you want. You also don’t have to use any real-world languages for inspiration and just go for sounds that seem to fit your story and setting. It’s up to you. Languages change. 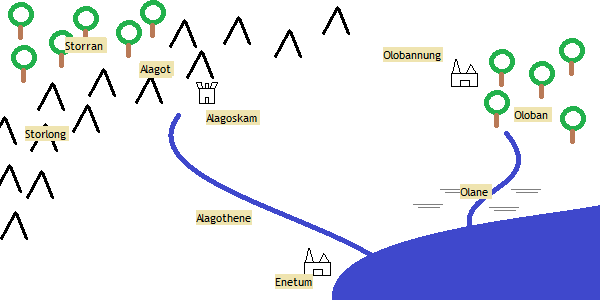 As I mentioned above, place names tend to be conservative, but they do follow the same patterns of sound change that affect the rest of the language. A little familiarity with linguistics helps, but its not hard to come up with a handful of sound change rules and apply them to your names once they’re formed. Now, let’s make up a few sound change rules. This helps disguise your work and makes the world feel a little more lived-in and less fresh-out-of-the-box. In a world that has existed for any length of time, languages have come and gone, whether by conquest, colonization, migration, or language change. The remnants of these changes are recorded in place names. In England, for instance, you will find the evidence of Britonic (London), Latin (Colchester), English (Brighton), Old Norse (Whitby), and Norman French (Stoke Mandeville). Sometimes multiple languages are reflected in the same name, such as Corbridge (Latin and English) or Chetwood (Britonic and English). Similarly, people who live in the desert will not just call everything “desert,” but distinguish rocky from sandy, sheltered from exposed, elevated from depressed, and so on, but they might have only one word for “mountain.” To make your place names sound authentic, you’ll want to give them the same kind of specificity. Here are some starter lists of terms you may want to use for your own place name generating needs. Adjust however seems fitting for your setting. Have fun mapping your imaginary worlds.